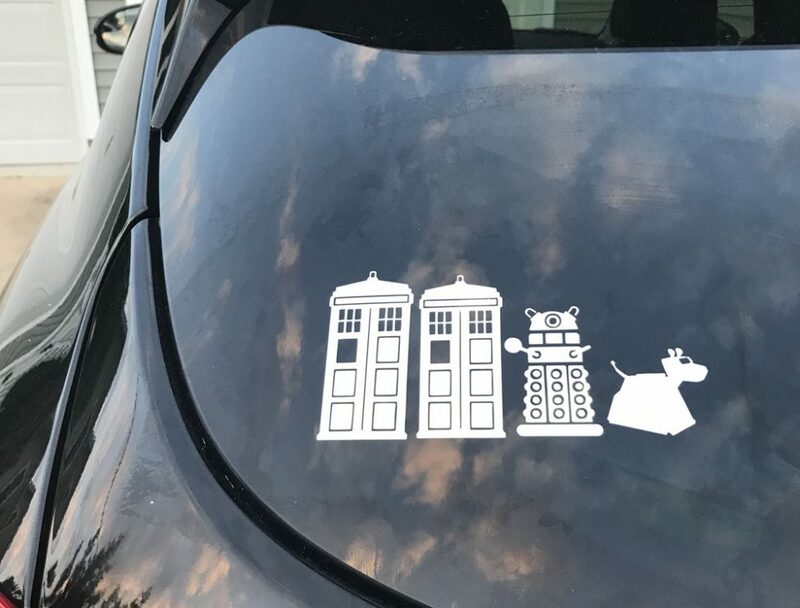 I reviewed the Cricut Explore Air 2 for GeekMom before I started this new job, and this was one of the test projects I made using it. I got the Doctor Who clipart on Etsy, from ArtsyFartsyChicz. And I used the Cricut software to size these and cut them out in white Oracal 651 vinyl. The first attempt I tried, which is in the GeekMom post, was way too big. I kept it on for about a day and got tired of it. The version that’s actually on my car is about 3″ tall at its highest point. And, I love these. So far they’ve held up perfectly fine in the heat and the summer rain, and I like the switch to a new fandom for this car. I need to think of some new projects to tackle with vinyl. Wait a second. Your child is a genetically engineered mutant consumed by hatred and hell-bent on killing everything in the universe it considers to be unlike itself? That’s got to be more effective than a “Baby on Board” sign.